Aeon rugs are a high quality, cut & loop pile rug with silky contours and a beautiful shimmer effect. 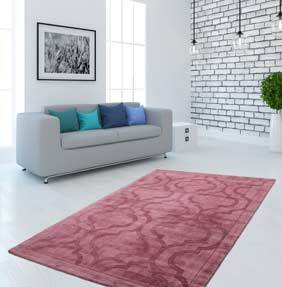 The stylish contoured rug is a tasteful addition to the modern living space. Through its heights and depths, this soft carpet offers tangible comfort and relaxation elements. This silky soft rug has a wonderfully dense pile and soft colour range. The beautiful geometric pattern complements every room with an elegant and tasteful ambience. Due to the fascinating 3D effect, which is enabled by the special cut-and-loop method, the rug is perfectly integrated into your interior style. The high-quality viscose shimmers like silk and will appear to change as you walk along it. This piece is sure to quickly become a prominent feature in the home. Since this collection is very popular, it is available in 4 striking colour variations, and has 4 different sizes to choose from. The beautiful pattern flatters every room and lends an elegant and tasteful ambience.